Brimming with both acuity and grace, Can You See Anything Now? is a welcome challenge to the dogmatic conventions of modern Christian fiction. 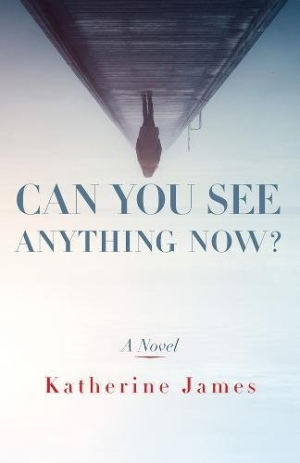 The unsanitized, transgressive tendencies and the thoughtful style of Can You See Anything Now?, by Katherine James, construct a much-needed bridge to the intellectual side of religious fiction. The small town of Trinity is home to a host of characters, all with their own imperfections and foibles that they must overcome. Margie, a painter recently diagnosed with multiple sclerosis, fails to kill herself, but amidst the town’s speculative and judgmental whispers, she befriends Etta, her evangelical Christian neighbor. This match is made all the more strange and intriguing when Margie sees something in Etta’s homespun paintings of tomatoes and convinces Etta to learn how to paint human figures. Margie’s daughter, Noel, a Columbia student, wrestles both with her drug-addicted and self-harming roommate, Pixie, and with her attraction to Owen, a childhood friend from Trinity, in a will-they-won’t-they romance. But when Pixie visits Trinity over winter break and falls under the ice of the Weekeepeemee River, her subsequent coma becomes a source of much pain and much healing, particularly for her estranged father, Pete. The novel is brutally honest in its relation of these characters’ struggles. This willingness to stare into the darker depths of the human experience is refreshing in a novel that also claims Christian trappings. Rather than pretend certain words, actions, and people don’t exist, James does not shy away from peppering her novel with a diverse cast and their diverse opinions and vocabularies. There is enough light that peeks through to provide some breathing space. Etta is the primary provider of this relief, as she is portrayed as kindly innocent rather than judgmentally naive. Her interactions both with Margie and with the more gossipy members of the Trinity community provide a portrait of open-minded inclusion that should be characteristic of more Christian literature. Despite its unvarnished subject matter, the prose possesses moments of lovely lyricism. Carefully chosen details create scenes that are tangible in their realism. Literary and pop-culture references alike stimulate and potentially broaden the intellect.